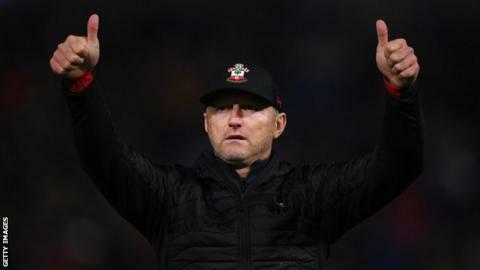 The beers are on Ralph Hasenhuttl for his first home game in charge of Southampton this weekend. The Saints manager, 51, has sent free drinks vouchers to season ticket holders for the Premier League match against Arsenal at St Mary's on Sunday. And the Austrian hopes fans will get to toast only a second home league victory in the past year for the struggling Saints, who are currently 19th. "I'm a guy who always brings everyone in our boat to row with us," he said. "You never know, maybe on Sunday comes the first win for a long time at St Mary's." Saints' last home league win was against south-coast rivals Bournemouth in April under Hasenhuttl's predecessor Mark Hughes, who was sacked on 3 December. And their previous top-flight victory at St Mary's came in November 2017, when Mauricio Pellegrino's side beat Everton. Who is new Saints boss Hasenhuttl? Former RB Leipzig boss Hasenhuttl, whose opening match was a 1-0 defeat by Cardiff, said Southampton owed its fans. "You have to build up your credit," he said. "It's like an account - if you always take money off sometimes it's empty. Now we have to put money on the account. "We try to invest something and show them that we are working harder and put more in games." Hasenhuttl also wrote a letter to season ticket holders to accompany the drink voucher, saying he was "very proud" to have taken charge and was "not afraid" of the challenge of keeping Southampton up. He promised an "intensive and very hard-working environment" and said he would push his players "to their limits". "If they go with me on this, then they will find a very rewarding journey," he wrote. "The other people I want to make sure I bring with me are you, the fans."